I almost cried when De La Soul came earlier this year and I couldn't make the show... but I guess the good lord listened to my prayers... I'm an Athiest ;)... De La Soul @ Emo's on June 21st! Along with Austin's own Just Born for Emo's 15th anniversary. 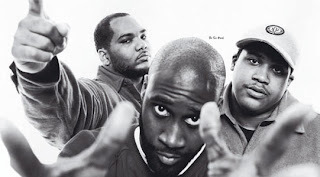 De La Soul is a Grammy-award winning hip hop group from Long Island, New York. They are best known for their eclectic sampling and quirky, surreal lyrics, and their contributions to the evolution of the jazz rap subgenre. The members are Kelvin Mercer (Posdnuos, Mercenary, Plug Wonder Why, Plug One), David Jude Jolicoeur (Trugoy the Dove, Dave, Plug Two) and Vincent Mason (P.A. Pasemaster Mase, Maseo, Plug Three). The three formed the group in high school and caught the attention of producer Paul Huston (Prince Paul) with a demo tape of the song "Plug Tunin'". Prince Paul was also sometimes referred to as Plug Four. They also have their own Nike SB Dunks Called the "De La Souls." With its playful wordplay, innovative sampling, and witty skits, the band's debut album, 3 Feet High and Rising, was hailed as a hip hop masterpiece. It is also the band's biggest commercial success to date, with their subsequent albums selling progressively less, despite receiving praise from critics. 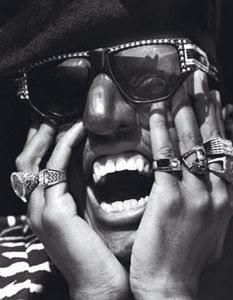 The group has influenced other hip hop artists such as Camp Lo, Black Eyed Peas, and Digable Planets. They were also instrumental in the early stages of rapper/actor Mos Def's career, and are a core part of the Spitkicker collective. They are the longest standing Native Tongues Posse group, after the Jungle Brothers. Hmm... didn't know Sage won the Scribble Jam... Sage Francis @ Emo's on June 9th. Buck 65 and Austin's own Vehicular. So standing at the urinal today... coworker next to me... he decides he's going to pick up an unlisted phone call... and I decide I'm going to flush the urinal... too bad the guy behind us didn't fart it up. Paul "Sage" Francis (born 1977 in Miami, Florida) is a hip-hop artist based in Providence, Rhode Island. 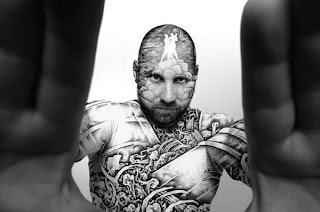 Sage Francis's style blends a varying tone and delivery with subject matter that focuses on intricate sequences of widely varying imagery, metaphors, the occasional pun, absurdism, and pop culture references, while including the occasional touchstones of traditional hip hop storytelling and self-promotion. Francis holds two degrees, an AA in communications from Massachusetts' Dean College, and a BA in journalism from the University of Rhode Island. During the mid-1990s, he recorded his first demo tape (1996), fronted the now defunct Providence hip-hop band Art Official Intelligence, and hosted a weekly slot on independent radio station WRIU (the "True School Session"). He also formed the Non-Prophets, a group that released a 12” ("Drop Bass/Bounce/I Keep Calling," Emerge Records, 1999), following up in 2003 with their first full-length offering, Hope. 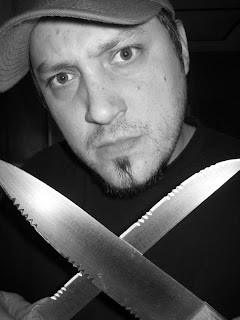 Francis is a contemporary of underground hip-hop artists such as Slug, Aesop Rock, and the anticon. collective. He is also loosely affiliated with the vague underground hip-hop supergroup The Orphanage. As a battle rapper, Francis won the 2000 Scribble Jam, a competition considered to be the most sought after prize in the freestyle battling scene. He then came back the next year to finish as a semifinalist. Francis set up his own record label Strange Famous Records through which he has put out the majority of his records, mostly collections of live songs, radio freestyles and spoken word tracks. Lifesavas are a hip hop trio from Portland, Oregon, notable for what The Onion's Nathan Rabin called their "self deprecating style". Like many of their peers on Quannum Projects, their lyrics tend to be rhythmically intricate and emotionally introspective, although it contains little of the self-lacerating qualities found on the inhabitants of underground hip hop labels like Anticon and Lex. Instead, they take a more positive approach, especially noticeable in songs like "Livin' Time". They take a dim view toward the prevailing "gangsta" trends and what they view as the "dumbed down" and "immoral" tendencies of mainstream American rap. Other topics covered on their debut album Spirit in Stone include politics, social relationships, religion and racial progress. 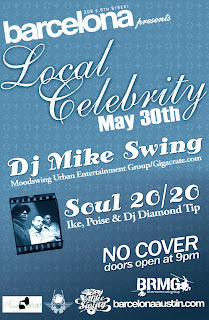 Ike, Poise, DJ Diamond Tip of Soul 20/20 and DJ Mike Swing will celebrate their local fame @ Barcelona on May 30th. That classic sound is coming out of Austin, Texas, and its making noise in the hip hop scene as Mike & Ike present their debut album, Introducing Mike & Ike. The duo blends smart, but accessible lyrics with the infectious sounds of jazz and soul music to create a style that recalls the best elements of where rap music has been, but stays fresh and inventive, always looking toward the future. In a musical landscape full of studio gangsters rapping about how hard they are and money they may or may not actually have, Mike & Ike are a refreshing change of pace. Rather than fall into the all-too-common trap of preaching about what they are not, however, they choose to focus on what they are, and the original styles they bring. They kick intelligent rhymes that a wide range of people can relate to their own daily struggles and triumphs. The raps show that the two are aware of and concerned about social ills, but avoid becoming overly self-righteous or cliché in their treatment of them. Mike & Ike know when to be serious, but never lose sight of the idea that hip hop should be at least as much about the good as the bad, and maintain an overall positive and fun vibe on the album. Tracks such as "Classic Sound", "Home Invasion", and "Genie in Disguise" show that Mike & Ike have what it takes to bring their classic sound to the masses. Melding some interesting genres to produce a sound all their own... Sol.Illaquists of Sound @ Emo's on May 28th. Sure to be a good show with our own Tee Double... and DJ J.Storm, Grey Matter, and Maestro. sol·illaquist of sound (soul il kwist uv sah oo nd) n. 1. A play on words describing an individual whose efforts in searching for one's self reveal his/her soul to an audience, often through some type of art medium. 2. One who recognizes his/her self and the reflection of self in those around them see also Swamburger, Alexandra(h), DiViNCi, Tonya Combs, and Charles Wilson III. It would be an understatement to call the Sol·iLLaquists of Sound a mere Hip-Hop Band. Their message and ambitious fusion of varied stylistic genres continue to reinvent the perceptions and experience of music as a whole. The group consists of four dynamic individuals: Swamburger, Alexandrah, Tonya Combs, and DiViNCi. As they are each talented, focused and motivated enough to hold their own, they prove to be an undeniably ruthless force when working together. Backed by a powerful message of self-awareness, the Sol·iLLaquists combine rapid-fire lyricism, jazz-tinged vocals, insightful poetry, and innovative live electronic performance. It's not a rare occurrence for members of the audience as well as the band to be brought to tears by the level of truth and energy put forth in any one Sol·iLLaquists performance. Do you feel like birthday's are just another day? or a day to lavishly celebrate one's birth? I'm pretty conflicted. While I feel birth is a great and wonderful thing and one's birthday is special, I also feel awkward to be showered with attention for the work of my parents and not something that I had any direct influence over. Well my birthday's tomorrow. El-P aka El-Producto (born Jaime Meline on 4 March 1975) is an American rapper, producer and entrepreneur from Brooklyn, New York City. A major driving force in alternative hip hop for over a decade, he is the co-founder, owner and CEO of the Definitive Jux record label. 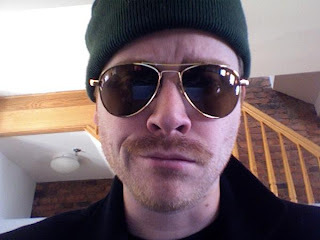 , El-P (born Jaime Meline) became involved with the hip hop culture of New York City at an early age. After being expelled from several schools for problems with authority, Meline decided to whole-heartedly pursue a career in music. At his 18th birthday party, he met Mr. Len, whom he had hired as a DJ for the night. The two quickly became friends and formed Company Flow in 1992. They released their first vinyl single, "Juvenile Technique", in 1993. 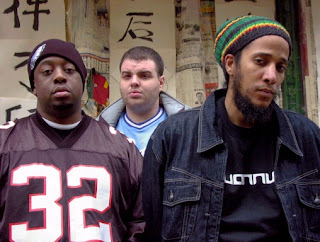 Bigg Jus later complemented the group and in 1996 the trio released their debut EP, Funcrusher. Subject to a major label bidding war after the success of the EP, Company Flow waited until they could get a contract on their own terms. They eventually signed to Rawkus Records, and released their debut full-length album, Funcrusher Plus (1997), which is now widely recognized as one of the most ground-breaking and influential alternative hip hop albums of all time. Update: It looks like Scion's expecting a full house. They recommend people go to the Travis County Expo Center from 5-9pm day of the show to pick up guaranteed admission tix. 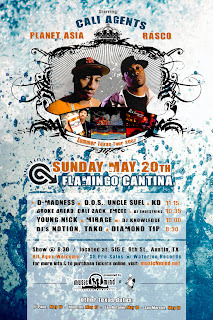 It was back in '05 when Ernesto, Mike and I went to the DJ Q-bert show at Sky Lounge... that was when in my hyped and drunken stupor I decided I gotta see more shows and Austin Hip-Hop Scene was born... so this kinda makes me feel like I've come full circle... DJ Q-bert @ The Parish on May 24th! With DJ Craze, DJ Klever, and Table Manners Crew. See ya'll there! QBert (born October 1969) is the performing name of Richard Quitevis, a Filipino-American (of Ilocano descent) DJ and composer. 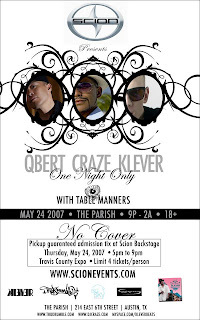 Growing up in San Francisco's Excelsior District on Moscow Street, he graduated from Luther Burbank Middle School and in 1987 from Balboa High School. . Q-Bert started playing with records at the age of 15 and was influenced by the street performers and graffiti artists of the local hip-hop community in the mid 1980s. 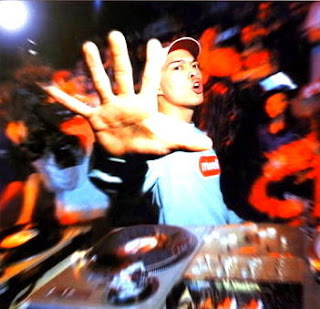 It was at Balboa's school cafeteria that he went up against Mix Master Mike in his first DJ battle and lost. Never heard of Brother Ali... but if he's on the same label as Atmosphere, MF Doom and Blueprint... you know what I mean... Brother Ali @ Emo's on May 16th... boy's got some pretty poignant lyrics... check out the vid. So... went to Yao Ming's restaurant Saturday night... and it sucked... sad to say... it wasn't even as good as P.F. Chang's... and P.F. Chang's is really bad. Brother Ali (born Jason Newman, now Ali Newman) is an American hip hop artist. Originally from Madison, Wisconsin, Ali moved to Minneapolis, Minnesota at age 15, where he became involved in the local hip hop scene. He's signed to Rhymesayers Entertainment, a hiphop record label founded by Brent Sayers, Musab S'ad Ali, Derek Turner, Anthony Davis, and Slug, the frontman of Minnesota rap group Atmosphere, with whom Ali has become fast friends. 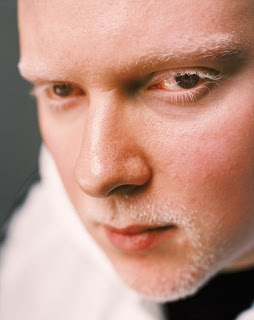 Ali is an albino and although his appearance made him the brunt of bullying in high school (his response is chronicled on the track "Win Some, Lose Some"), he has come to be unabashedly proud of his distinctive features, celebrating it in a track called "Forest Whitiker", where he called on "anyone out there who's a little different" to stand up and exult in who they are, rather than stay ashamed. Ali is also a devout Muslim, religion being a theme that is mentioned in several of his songs including "Self taught" and "Victory." So it's Mother's Day coming up... I'm gonna try to take mom to Yao Ming's restaurant... Yao's her favorite player... she knows more about Yao and the Rockets than I do. Planet Asia also known as King Medallions (real name Jason Green) is an underground rapper from Fresno, California who is a member of hiphop groups the Cali Agents, and Skhool Yard. He is also well known for his vast discography of mixtapes. During the 1990's, Planet Asia moved from Fresno, California to San Francisco, California and started rapping religiously. From 1997-2001, Planet Asia had been releasing various popular 12 inch singles. These singles such as "Definition of ILL" and "Place of Birth" were released by various labels such as Stones Throw and ABB Records. He reached full acclaim in 2001 when The Source gave him the First Round Draft Pick and Independent Album of the Year awards for How the West Was One. How The West Was One was recorded with fellow rapper Rasco under the group name Cali Agents and landed him a deal with Interscope Records. 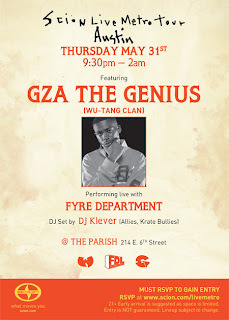 Scion's at it again... GZA @ The Parish on May 31st. You know the drill... RSVP here. WU-TANG! GZA (pronounced Gizza), aka The Genius, born Gary Grice August 22, 1966 in Brooklyn, New York City is an American MC . He is most well known as a founding member of the seminal hip-hop group the Wu-Tang Clan. 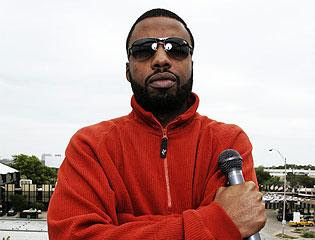 In addition to appearing on all the Wu-Tang Clan albums he has released four solo albums and has appeared on many other Clanmate's solo releases. Born in Brooklyn, GZA spent his childhood living with various groups of relatives in the other New York boroughs. During this time began to visit the Soundview Projects in the Bronx where he became fascinated with hip hop. Influenced by the early MC's of the time he began to write his own rhymes. 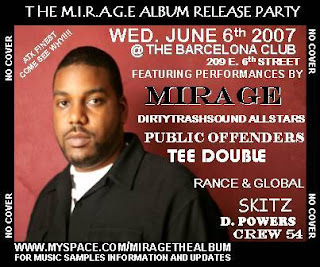 Mirage wrote in to tell us about his upcoming album release on June 6th @ Barcelona. And he's brought out some heavy hitters for this auspicious occasion. DirtyTrashSound AllStars, Public Offenders, Tee Double, Global, Crew54, and so many more. Mirage is the only Soulhop artist in the world currently. He created the genre himself; it is the perfect mixture of his soulful Texas roots and the Hip Hop culture that is so much a part of his life. Mirage remains one of the most respected yet slept on up and coming artists in Texas. He hopes to change the “slept on” part with the release of his 4th album, self-titled M.I.R.A.G.E. The album is perhaps his most diverse and personal of his career thus far. It features production from some of the best in Central Texas as well as France. There are very few guest artists on this album, on purpose. Mirage say’s “I wanted the people to see who Mirage is at this point, and this is an album, not a compilation. Coming off his new album release... Awol One @ Emo's Lounge on May 7th with Josh Martinez and MSG Crew. Could a girl farting be the funniest thing... Especially when it's loud and smelly? How do you react in that situation? Would you just be grossed out? I usually fart right back. Awol One (Tony Martin) is a California-based rapper/underground MC. Awol One has gained a following in the underground hip hop world with tracks like "Rhythm". He has worked with such artists as KRS-One, Kool Keith, Daddy Kev, Fat Jack, Mike Nardone, Mascaria, Jizzm, Aceyalone, 2Mex, Busdriver, Slug, Deeskee, etc etc. 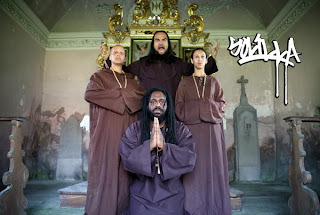 Awol One (aka Awolrus) is part of the L.A based underground hiphop group The ShapeShifters. 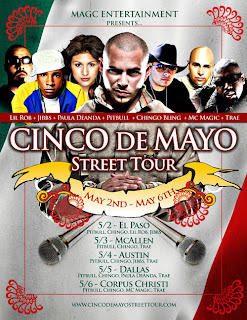 They Can't Deport Us All... Chingo Bling @ Spiro's on May 4th along with Pitbull, Jibbs, and Trae. More info here. Saw Stomp at the Paramount tonight... it was pretty good... but how many ways can you bang on a trash can?!? :) You gotta give props to those guys though... it's some hard work. Have a good Chingo de Mayo! Chingo Bling graduated from Trinity University in San Antonio, Texas with a BA in business administration, was a member of the national business fraternity ΑΚΨ, and is CEO and founder of the record label Big Chile Entertainment.